This post examines why academic-led journal publishing is key to lowering the rising cost of research, the technology that’s defining the academic-led publishing movement, and a detailed case study of a modern academic-led journal. There’s a new phenomenon in the realm of academic journal publishing, which has long been ruled by a handful of corporate publishers commanding profit margins in excess of 30%: in recent years, learned societies, libraries, and groups of scholars have begun taking back control of academic journals by flipping corporate-run journals to academic-led publishing models and launching new open access (OA) titles online. Could enough brave academic-led publishing Davids take on Goliath publishers like Elsevier? While disparities of size may make this matchup seem near impossible, it’s important to remember that it’s not always the magnitude of a competitor that determines their success, but rather the tools they use. The internet is making research dissemination easy and affordable, so that even the leanest of publishers can prevail. Why academic-led publishing? And why now? One word: technology. Since the early 1990s, academics have championed making research open access, or free to read online, as the way to break down prohibitive paywalls - but it hasn’t proven to be enough to make research truly accessible. Even with more journals adopting online-only OA publishing models, the cost of research is not necessarily going down. Many publishers are simply shifting their income models from subscriptions to growing APCs. Between 2012 and 2016 the average APC was nearly two thousand dollars and the consumer price index for APCs rose by around 5% - well above the rate of inflation. How will academic-led journals and presses take down such publisher giants? So long as these power differentials remain in place, the metaphorical “academic publishing stage” will remain tilted. But, academic-led publishing has the power to change all of that. While publishers were deemed necessary in the age of print and the advent of online publishing, when the tools and specialized knowledge to publish weren’t easily accessible to academics and scholarly institutions, in our 21st-century research environment anyone can publish an online journal with the right software. You can go ahead and slash “specialization” off the list above. Moving onto the next two items: As tools put the power to publish into everyone’s hands, centralized journal control will dissipate as well. What’s left? - “control over bibliometric impact measures.” As Eisen notes, “academia is an industry of prestige, and the currency in which prestige is traded is journal titles,” which are mainly rated by Impact Factor. However, online publishing is also shifting scholars away from the idea of “journal brands“ and journal-based bibliometrics. As scholars transition from looking for journal titles to looking for relevant research at the article level via online searches, article level metrics are becoming leading research impact indicators. And online tools are making it possible for journals of all sizes to track these stats. Item number 3 is no longer a stronghold. The academic-led journal publishing future isn’t some far off utopia - it’s an open frontier waiting to be explored. And, as explained by Björn Brembs, Professor of Neurogenetics at the University of Regensburg and OA advocate, it’s the only way forward. There are countless examples of OA journals being produced by non-profit publishers and groups of scholars at a fraction of the cost of corporate publishers and without imposing copyright constraints on scholars. Examples of alternatives to corporate-run journals include Collabra Psychology, a University of California Press OA journal that operates with a below-market APC of $875, and Discrete Analysis, an arXiv overlay mathematics journal that operates with a small grant from the University of Cambridge and without author or reader fees. These journals are following the service-based publishing model described by Brembs and, as such, they remain in academic control. The tools to publish academic-led journals are clearly out there, but do enough academics and institutions know about them? The idea of developing a publishing toolkit that Adema and Stone suggest in their article is a great analogy. Academics should learn about the tools available and then gauge the time and knowledge needed to implement each. The beauty of academic-led publishing using software and services is that scholar-led journals and institutional publishers can select the right publishing model and mix of tools to meet their needs and save time. A great example about spreading the word about academic-led publishing and different models available is Sarah Lippincott’s article “Library as Publisher: New Models of Scholarly Communication for a New Era,” which provides a comprehensive overview of how libraries can launch and support academic-led journals. Even groups not yet ready to launch an academic-led journal or publishing program should start to fill their toolboxes with information! We’ve discussed the need to lower research access costs as a primary reason for academic-led publishing - but what about improving research quality and discoverability online? 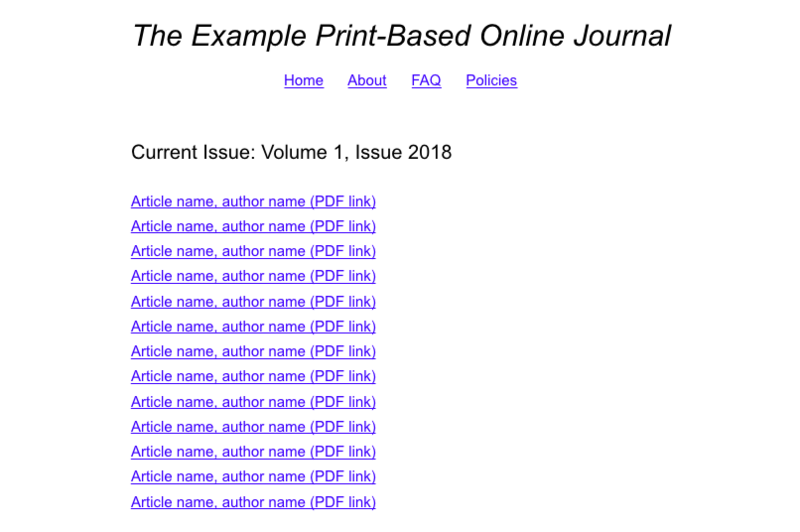 The predominant journal publishing model is rife with print-based anachronisms that are holding back research from using the internet to its full potential. If you’re not convinced of the need for journals to transition to born-digital and online-only publishing models, consider the 2015 STM report, which states: “All STM journals are now available online, with just a few exceptions [and…] print editions will […] start to disappear from publisher’s lists in significant numbers over the next couple of years.” Focusing on print publishing models is not the answer to a modern research future. All we have to say is - 1992 called - it wants its journal website back! In all seriousness, websites that are laid out like this are not designed to provide a modern reading experience. Corporate-run print-based journals have been slow to adopt online publishing best practices. But, with affordable online tools, and without publisher constraints, academic-led journals can easily forge modern digital-first publishing models. Fields Medalist Timothy Gowers spoke to the importance of academic-led journals paving the way for more modern publishing practices in an interview about his decision to launch Discrete Analysis using Scholastica Open Access Publishing. “I hope [scholars] will notice that the journal’s website is far better designed than almost any other website of a mathematics journal. Ours is easier to navigate and nicer than the websites of any other journals or commercial publishers I’ve seen,” said Gowers. Let’s look at an example to map out what a modern open access journal should look like. Meet Survey Practice, an online-only journal published by the American Association for Public Opinion Research. They follow a service-based publishing model using Scholastica for peer review, open access publishing, and typesetting in order to produce modern open access articles. What sets Survey Practice apart from the predominant online journal publishing model? 2. 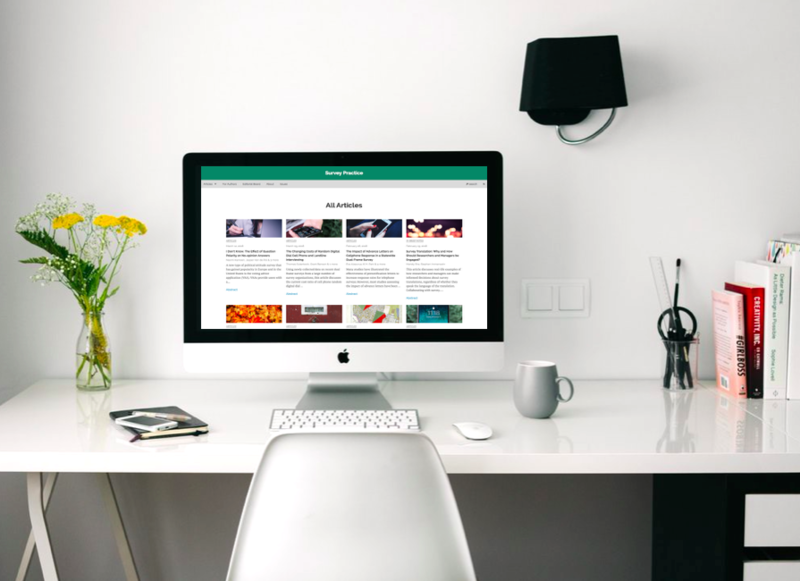 21st-century reading experience: Survey Practice offers a modern reading experience by publishing on a website designed for online journal browsing, rather than to mirror a print journal layout. The journal website showcases images of recent articles on its homepage and includes a dropdown of articles by category as well as article search functionality that scholars can use to easily browse content online. The journal website and its articles are also mobile-friendly. Using Scholastica’s typesetting service, Survey Practice is able to publish both HTML and PDF articles. When scholars navigate to articles, they are taken to the mobile-friendly HTML version with a quick PDF download button at the top. 4. Totally academic-led: Notice that we haven’t mentioned a corporate publisher so far. That’s because Survey Practice is able to manage peer review and publishing on its own. As a result, the journal is able to publish on its own terms and can keep journal costs, copyright, and access in the hands of the academic community. to production to distribution - back in the hands of the scholarly community. The tools to launch and operate academic-led journals are available today and constantly improving. Scholars and academic institutions have access to the knowledge needed to run journals, now all that’s needed is action. Open access is at a tipping point - it’s time for scholars to take back control. Let’s spread the word about academic-led publishing and how to get started. Founding editor of the Wine Business Case Research Journal, Armand Gilinsky, discusses how he launched the open access journal and how Scholastica has helped them set up a streamlined peer review process with impressive manuscript turnaround times.